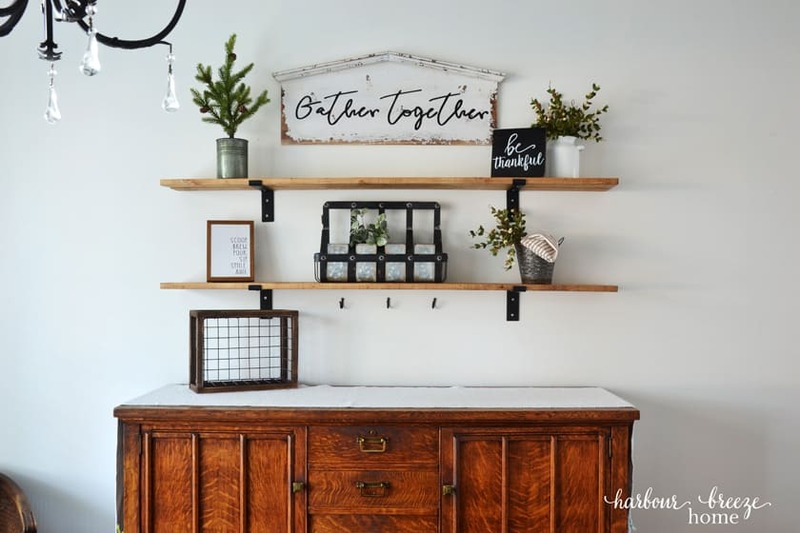 Are you a fan of Joanna Gaines’ Fixer Upper style? 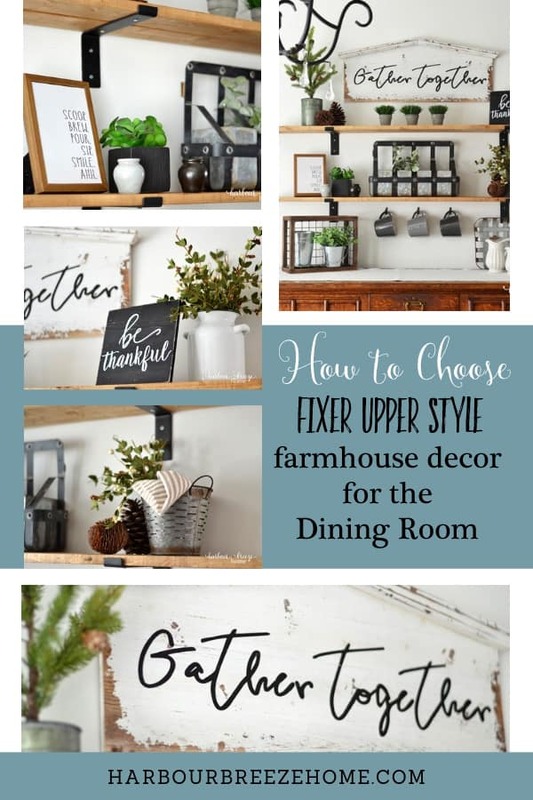 Learn how to choose farmhouse decor for your Dining Room like a pro with these 4 easy steps. 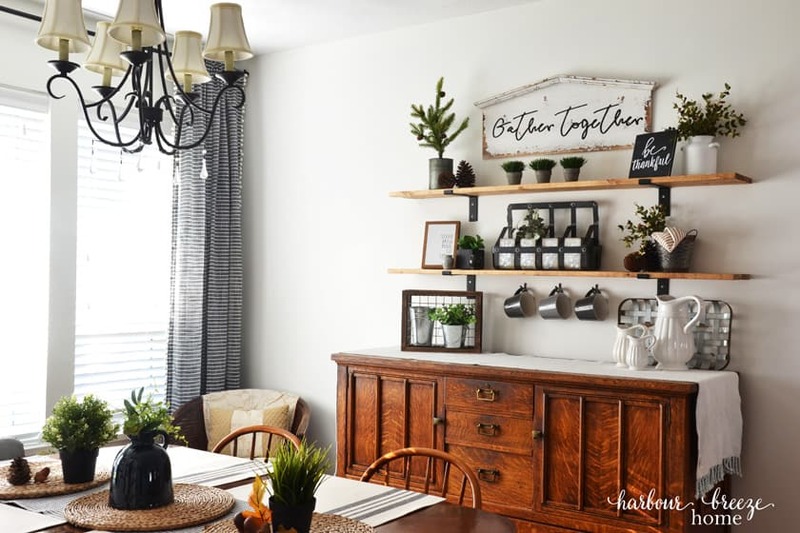 We recently installed the Fixer Upper style farmhouse shelves I’ve been dreaming of in our Dining Room. The black brackets I’ve been searching for were finally found during our vacation in Washington at Hobby Lobby. 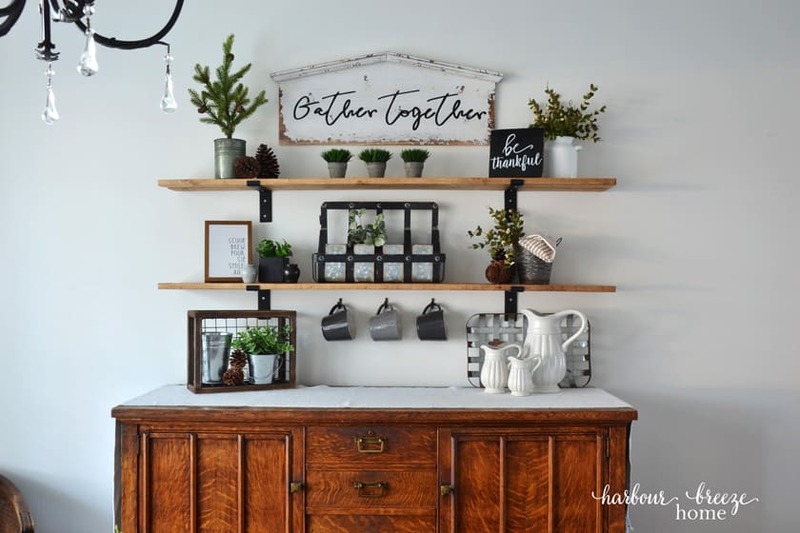 Along with finding the perfect brackets, I encountered aisles and aisles of Fixer Upper style farmhouse decor that I just LOVED! For those of you who live near a Hobby Lobby, you might not be aware that there are NO Hobby Lobby stores up here in Canada ~ nor is there anything remotely like it. 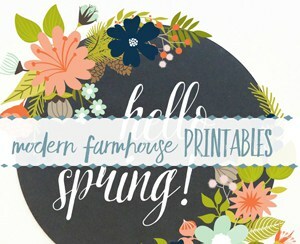 Seeing the huge selection of beautiful farmhouse decor (on sale for half price) threw me into a tizzy! I went to a nearby coffee shop to gather my bearings and come up with a plan. 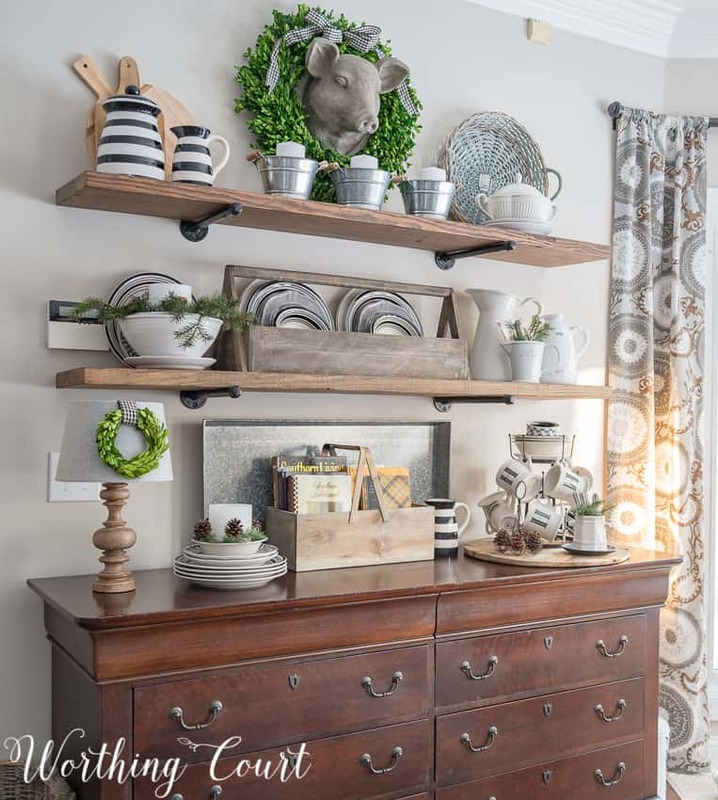 The first thing I did was get out my iPad and search Pinterest for “Farmhouse Shelves”. 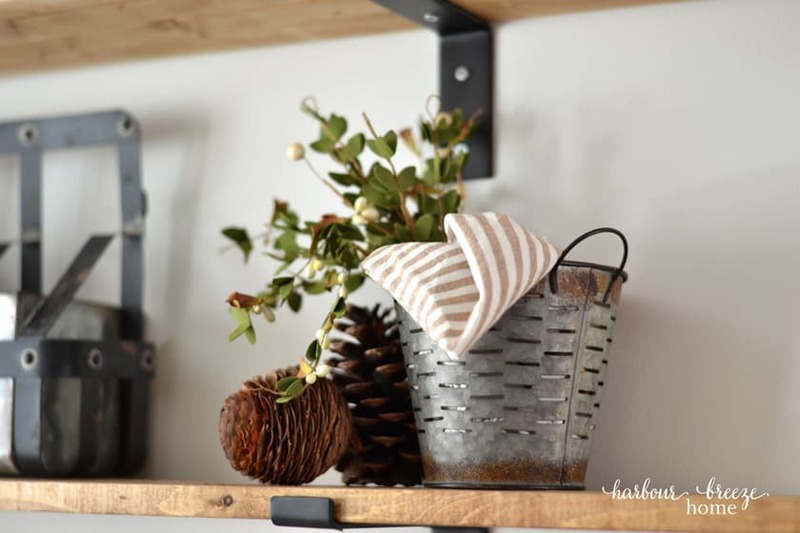 I saved the ones I loved on my Modern Farmhouse Style board and then spent some time analyzing what I loved about them. The one that I studied the most was this beautiful image from Worthing Court. As I studied the picture, I noticed there was a mix of different sized items as well as different textures. After I had a clearer picture in my mind of the types of things to look for, I went back to the store and grabbed a cart with gusto. The “Gather Together” sign was the first item into the cart. I wanted it to be the top focal point of the display. Then I searched out 2 other large items that I felt would give the “biggest bang for my buck”! Rather pile the shelves with a million tiny things, I’ve learned to start first with some large items that take up quite a bit of square footage. After studying rooms and spaces designed by Joanna Gaines herself, I noticed that there is often a mix of those four textures within a space. With that in mind, I chose a few more items that were medium in height. So, in the Christmas aisles, I searched for items that could be used throughout the year that wasn’t necessarily Christmas- specific. All the greenery pictured was in the Christmas aisle. And that cute enamalware vase on the top shelf? It’s hiding a Christmas secret. The back of it has a green “25” on it! As I shopped, I kept thinking about items that I already had tucked into my decor cupboard at home. They filled in the empty spots and made it look all finished. 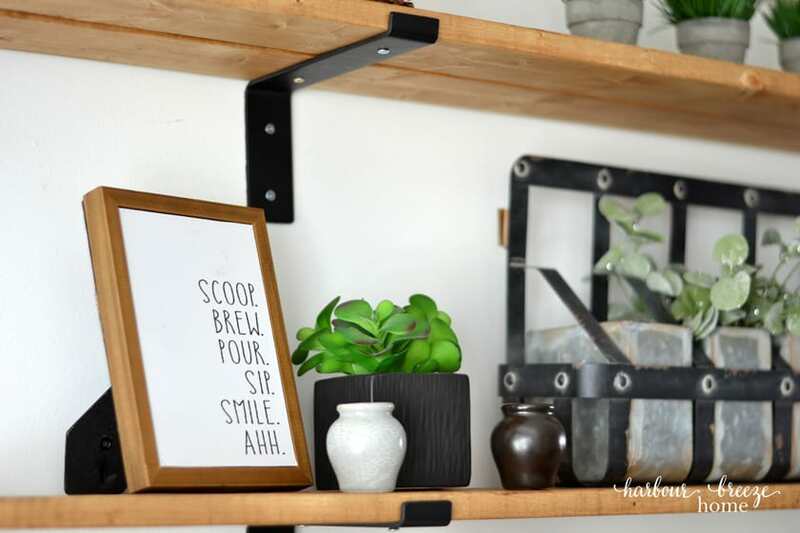 As I put the items on the shelves, I kept in mind the “zig-zag method” of styling that I described in this earlier shelf styling post. It basically means that you mimic colors and heights in a zig-zag pattern from one shelf to another. Take the white items, for instance. They zig and zag back and forth and help present an overall balanced look. 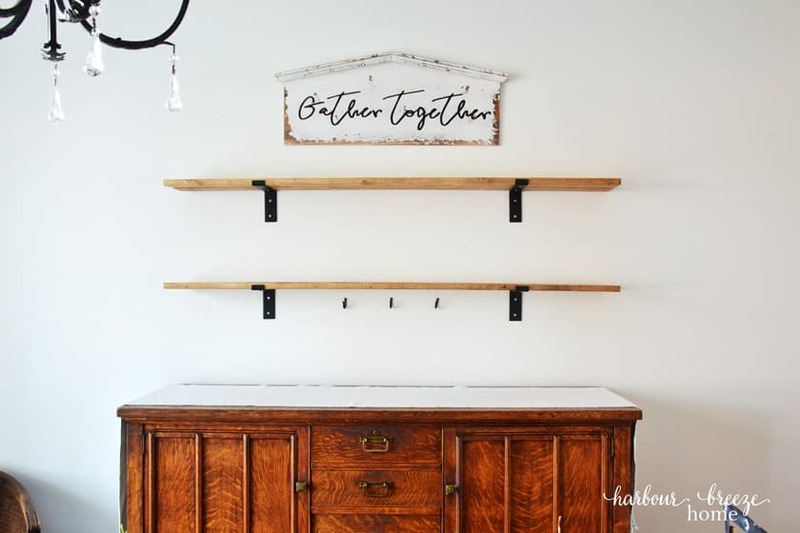 I’m so pleased with how these Fixer Upper Style Farmhouse Shelves turned out. Their cozy style works so well with my parent’s antique buffet that I love so much. If you’re more of a visual learner, I walked through the styling process and how I chose the items in this recent Facebook live. Thanks, friends, for taking time out of your busy days to join me over here on the blog. If you haven’t already, you might want to join me over at Facebook and Instagram for some extra behind-the-scenes snippets and inspiration from other blog friends. Rita, your formula works. 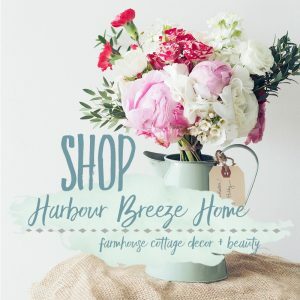 Love it all from your buffet table, to your shelves and sign. Lovely arrangement! 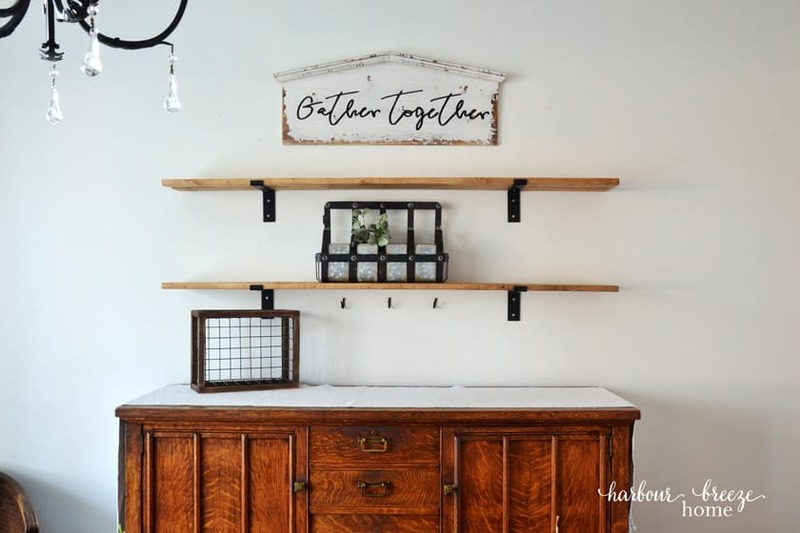 You know, I love farmhouse style, but I don’t incorporate black metal ever… but, now that you’ve mentioned it I’ve realize that maybe I should! Ha!! Oh, Hobby Lobby is just bursting with farmhouse style goodies. 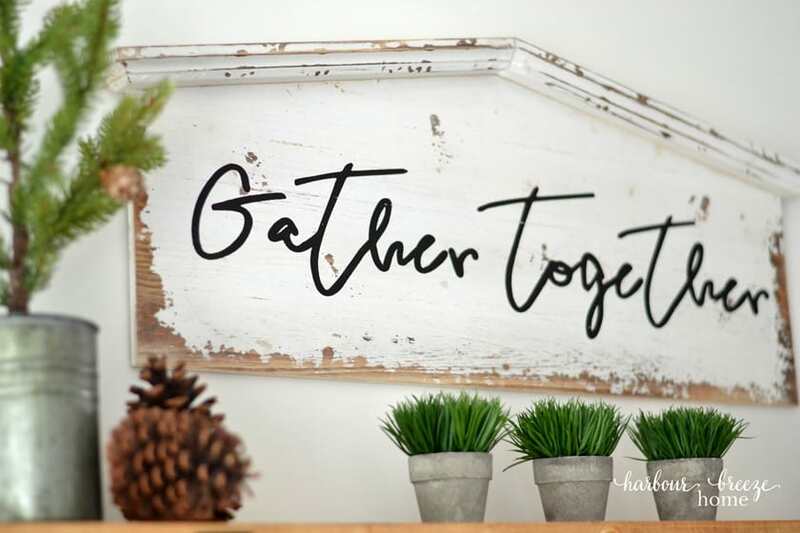 I love your first big anchor piece, the Gather Together sign. I think its my fave piece of all. Everything looks just lovely!! Rita, I always love the way you break things down for us. 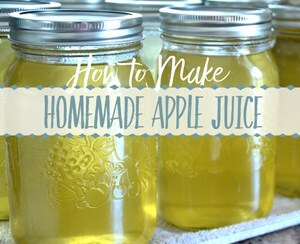 This was such a good, informative and fun piece to read! I usually follow my instincts when it comes to decorating, and that doesn’t always lead me to greatness. I’m a rule follower, so getting your “rules” or tips is soooooo helpful! Love the zig zag example in particular.